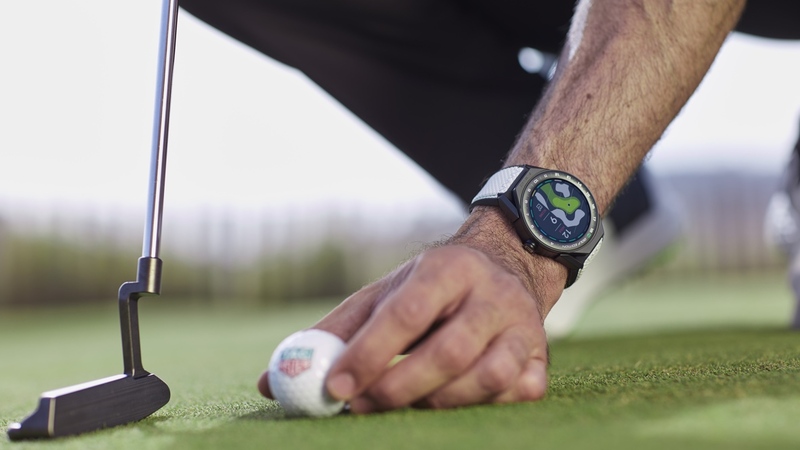 Tag Heuer has announced it's taken the Modular Connected 45 smartwatch it launched back in 2017 and given it a makeover for golfers. The Tag Heuer Connected Modular 45 Golf Edition introduces what the Swiss watchmaker says is a golf-inspired design, with shock-resistant materials making it a better fit for when you're out for a round. The 45mm sized watch features a 400 x 400 resolution touchscreen display, which is protected by scratch-resistant sapphire crystal. That screen is surrounded by a black ceramic bezel ring, laser engraved with a scale of 1-18 to indicate an 18-hole round of golf. It also features black ceramic lugs, titanium casing and is accompanied by a white strap with green stitching to continue the golfing theme, with an additional black rubber strap also included with the watch. But it's not just about the design here. Tag has developed a dedicated Golf app, which is free for iOS and Android and is also compatible with Tag's other Connected Modular smartwatches. In terms of features, it can display 39,000 golf courses from around the world, with the database regularly updated to account for new courses and changes made to existing courses. It'll record shot distances with an accuracy to within one metre, record scores for up to four players and display distances to green and hazards. It also offers 2D course mapping on the watch and precise 3D mapping Tag says is more advanced than anything else similar on the market. From the phone app, it uses vector technology to display courses in greater detail, displaying bunkers, fairways and rough with maps that are interactive and scrollable. After each round, scores and performance data are stored in the app and locally on the watch where you can delve into stats including including putting average, longest drive and score distribution. In terms of core smarts, you're getting everything that is available on Tag's other smartwatches. So it's running on Google's Wear OS and comes packing built-in GPS, NFC for Google Pay contactless payments, a mic for Google Assistant support, 4GB of storage and the onboard 410mAh battery, delivering 25 hours of play time. So, how much is the Tag Heuer Connected Modular 45 Golf Edition going to cost you? Unsurprisingly, it's not going to be cheap. It's available to buy now from the Tag Heuer website for $1850, making it similarly priced to the first Modular Connected 45. Tag is also throwing in three golf balls stamped with its logo to show off next time you go for a round.